Significant weight loss can result in dramatic changes in the face and neck. Massive weight loss may accelerate the facial aging process, with loss of the fat of the face, and decrease in skin thickness. As a result, there is often excessive sagging skin of the face and neck. The ligaments and muscles of the face and neck may also weaken, leading to jowls and a flatter more sunken midface. While people are pleased about the weight they have lost, they are often unhappy about the appearance left behind. Facelift and neck lift surgery after significant weight loss can restore self-confidence and give you the face and neck you always wanted. What is different about facelift surgery after significant weight loss? There is often more extra skin of the face and neck after massive weight loss. Also, the ligaments of the face may be weak, and there may be sagging of the jowls and muscles of the neck. While traditional facelift surgery used to just pull back the skin, Dr Harirchian’s facelift technique also repositions the muscle and fat pads that have fallen. She typically performs a deep plane dissection, which means she operates underneath the muscles of the face and neck, moving them to a higher position. As a result, the deep layers of the neck and face are tightened, and excess skin is removed. This is very important for long-lasting and natural results, as studies have shown longer lasting facelift results when the muscle is tightened. It is important for your weight to stabilize after weight loss before proceeding with a facelift or necklift. In addition, it is important to be in good health, including a good diet and no smoking. 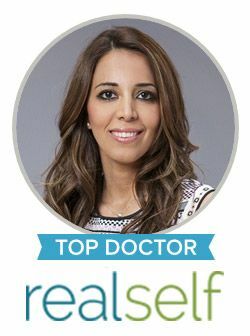 Dr. Sanaz Harirchian is a facial plastic surgeon in Houston, Texas and specializes in aesthetic surgery of the face and neck. Contact us today to schedule your consultation.